The Mod-RM series enhances the flexibility of being able to integrate in a single 19" Rack both the UPS and all the protected devices (HUB, server, back-up units, etc.). The wirings are preset to simplify all connections. Mod-RM has been specifically designed for those uses up to 9 kVA that need a flexible and extremely reliable system. The availability of free slots in Mod-RM 315 and Mod-RM 330 enables the use of other Mod-Power of the same power to obtain system redundancy or to increase the system´s power. The space available to insert the Battery pack allows the Mod-RM to sustain long periods of operating back-up, as shown in the back-up configuration on the previous page. The ease of managing these units is further enhanced by the availability of the NET VISION option. The SNMP/Web Manager IT enables control of the UPS via a simple Internet Web Browser or by using an NMS (Network Management Station). As your requirements change, MODULYS® changes with them. A simple Kit is all that is needed to transform Mod-Tower into Mod-Rack. 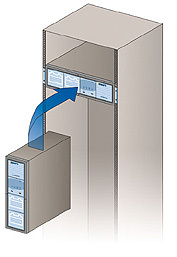 The ideal solution if your UPS is a Mod-Tower and the evolution of your IT environment forces you to transfer all your IT equipment such as Servers, HUBs, UPS and so on, into 19" cabinets. Moreover, the single units purchased as Mod-TW or Mod-RK can subsequently be installed in the Mod-System, supporting in this way your requirements for modularity, redundancy and flexibility. MODULYS offers total adaptability, fitting to existing architecture and installations, facilitating their evolution, and even making it possible to migrate from a tower to a rack configuration. Specifically designed for optimal modularity, MODULYS can be adapted to fit all dimensions and to meet all requirements. No matter what the nature of your evolution is (power, autonomy), each unit of your MODULYS system can be re-used to recompose your new power supply protection. Fully digital circuits, guaranteeing the highest possible operating reliability under all environmental conditions, support all the control and monitoring operations. If one unit dysfunctions, it does not affect the general system operation. Easy to install and use, MODULYS is a functional UPS design. All the power and autonomy units are "plug in", meaning they can be connected without interrupting your power supply. Modern network environments are required to operate with the utmost safety, in any environmental condition. The use of a UPS with your IT system guarantees an excellent level of hardware protection, supplying high quality electrical energy. The UPS on its own protects the equipment. Its use in conjunction with communication software such as UNI VISION, however, increases the protection provided to the hardware and the data it contains, safely carrying out actions such as the shutdown of applications before the power supply is actually interrupted. In the event of short or extended failures of the mains power supply, UNI VISION automatically executes all the operations necessary for the full shutdown of the PC/Server where it is running.